Please forgive the pretentious name – Symphony in Red & Green! But I was rather pleased by how this simple composed salad turned out. I am a firm believer that food that is pretty tastes better. So this was so simple there really isn't a recipe – just red and green salad vegetables laid out on a plate with salt and pepper and a drizzle of lemon juice and extra virgin olive oil. 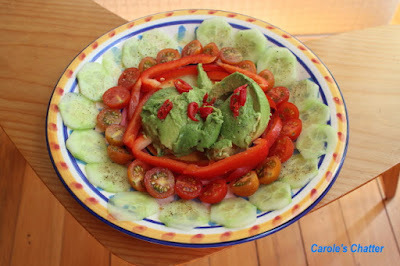 As you can tell from the photo, there were cucumber slices round the outside and inside the plate, then a row of cherry tomatoes, then red bell pepper (capsicum) and finally a whole avocado roughly scooped into the middle with red chilli slices on top.